Rakesh Kapoor (born 4 August 1958) is an Indian businessman. 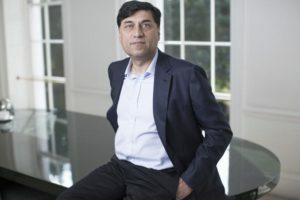 He is chief executive (CEO) of Reckitt Benckiser plc, a UK FTSE-listed multinational consumer goods company, a major producer of health, hygiene and home products. Kapoor was educated at Modern School, New Delhi, India. Kapoor has a BE (Hons) in Chemical Engineering from the Birla Institute of Technology and Science (BITS), Pilani, and an MBA from XLRI- Xavier School of Management, Jamshedpur, India. Kapoor joined RB when it was known, pre-merger with Benckiser, as Reckitt & Colman in 1987, serving in various roles including: Regional Sales Manager, North India; General Manager, Indian Southern Region; and Regional Marketing Director, South Asia. In 1999, he was appointed Global Category Director, Pest Control. Following the merger, he assumed the role of Senior Vice President, Home Care. He was appointed SVP, Regional Director, Northern Europe in 2001 and in July 2006, he was promoted to EVP, Category Development, with responsibility for global category management, research and development, media, market research and strategic alliances. His salary for 2015 was £23.2 million. In March 2014, in the wake of similar investor backlash protests over compensation for executives at Pearson, Barclays Bank, WPP, which are also listed on the The Financial Times Stock Exchange 100 Index  a share index of the 100 companies listed on the London Stock Exchange with the highest market capitalization  over 40 per cent of Reckitt Benckiser shareholders refused to support the companys remuneration report. Kapoor is an accomplished bridge player and a keen football and cricket fan.